A - Avery - She continues to bless our lives so richly! She is a very high-energy little 2 year-old! B - Birthdays - We celebrated Avery's 2nd birthday here with us and her twin brother's, Landon's, 2nd birthday in heaven with our Lord. 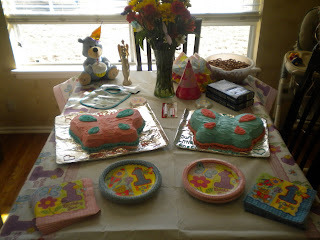 We celebrated with a Mickey/Minnie Mouse birthday. I made 2 cakes. Minnie mouse for Avery and Mickey mouse for Landon. We had a wonderful time and we also had a huge blessing that day. The blue and white tulips that we had planted last November in Landon's flower garden poked through the soil for the very first time on their birthday! So, B is also for blessings!! 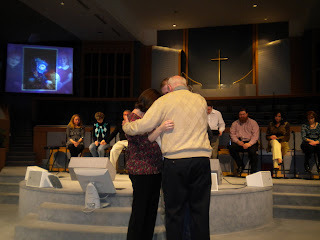 C - Christ - We would not have gotten through losing Landon without our Father. He has continued to reveal Himself to us and has shown His love to us in so many amazing ways. 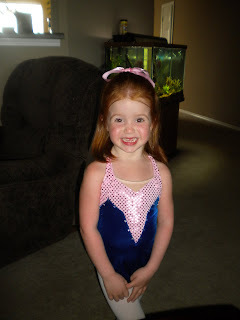 D - Dance - Addison is continuing to take dance lessons at Jenks Dance Academy where she is taking ballet, tap and tumbling. She absolutely loves it and makes up her own dances all the time! E - Easter - We had a great Easter, spending a lot of time with family. 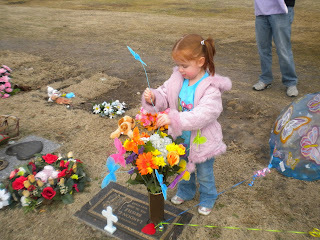 The kids decorated an Easter basket for Landon and we set it by his marker at Floral Haven. F - February - Always a very bittersweet month. Feb. 26th was Avery and Landon's 2nd birthday. Two of my friends also lost their full-term babies this past February. It was a very hard month. H - Healing - We continue to heal everyday. I'd have to say that we are better where we are right now compared to 2 years ago. There have been many hills and valleys and I know there will be many more. But, we have come a long way. J - Jesus - Continuing to surrender everyday to Christ. L - Linley - I almost become speechless when I think about her. To be completely honest with you, she saved me. She is such a blessing to our lives. I don't know what I would do without her! M- Mexico - My amazing husband surprised my sister and me with a cruise to Cozumel, Mexico in May! We had such a great time. It was a wonderful bonding time for us....something we don't get to do very often! N - Nutcracker - Addison and I went to the Nutcracker this past December. 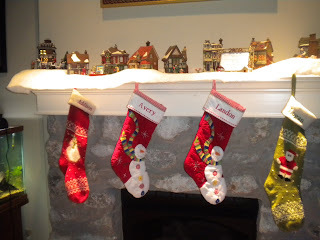 We have made a tradition to go every year and I look forward to when Avery and Linley are old enough to join us! 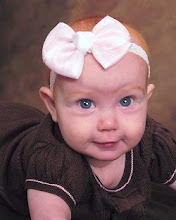 O - October 5, 2010, the birth of our 5th child, Linley Gregg Bristle! P - Physical Therapist - I went back to work as a part-time physical therapist at the Oklahoma Surgical Hospital. Going back to work has also played a part in helping me to heal. I feel a little more "normal" doing something that I use to do and enjoy very much. My whole perspective has changed when it comes to my job. I enjoyed helping my patients and all, but now there is a lot more compassion. I have been able to share my story several times with some of my patients and they have been able to open up and share with me some of their trials and how they pressed on. It has also helped me to become a better mom. I look forward to my days off with my kiddos and those days are a lot more purposeful now. Q - Q has always been a hard letter. Hmmm....let's see, I would have to say "quiet." I have learned to be quiet and still and listen to God. Also, to listen to others. You can learn a lot when you just sit still and listen. R - Ryan - My husband continues to be my rock. I have put him through so much during this journey of grief and he has stood by my side.....completely unwavering....and has loved me unconditionally. T - Tulsa Tough - I recently biked the Tulsa Tough with my best friend. It was a 30 mile bike ride through Tulsa. We had a great time, but was I ever sore! This was the first time either of us had been back on our bikes in about 1 1/2 years! It's time to get back in shape!! U - Upwards basketball - Logan enjoyed playing in the Upwards Basketball league at our church. Logan is really becoming quite the basketball player. Ryan really enjoys coaching the team. V - VBS - I recently helped co-direct the preschool side for VBS at our church. The theme was "Pandamania" where the kids learned how God is crazy about them! They loved it!! 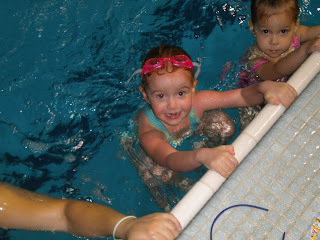 W - Whiteside Gym - Avery got to take her first gymnastics class at Whiteside gym. She absolutely loved it! She is our little monkey...she climbs on everything! She will make quite the gymnast someday!! X - Another hard letter!! I'm going to cheat and say Expedition. We went on "Expedition Everest" while at Animal Kingdom at Disneyworld. We got to spend 4 full days at Disneyworld and we enjoyed every bit of it! I'm ready to go back!! Y - Youth group - Ryan and I continue to serve as D-group leaders with our youth group at church. We have done this for the past 4 years and have really gotten to them very well. 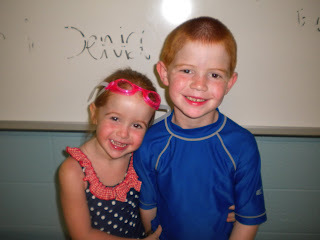 Z - Zoom - Logan and Addison's teachers did an ABC countdown during the last 26 days of school and they used the word "zoom" for the last day...."zoom out of second grade," "zoom out of preschool." I still can't believe that the school year is over. It seems like this year is zooming by. But, I do have to say, that I am learning to slow down, breathe, listen and learn. Well, that sums up a little of what we have been doing these past months. We are so blessed and so thankful of the many ways God has blessed us. We are so grateful for our family, our friends, our amazing church. Our hearts are still healing. I know it will take a long time. Probably the rest of our lives. But, I have learned to just sit still and think and reflect about all that I have here right now on this earth and about the amazing promise of eternity that we have ahead of us. You know, I really wish I had more time to blog! 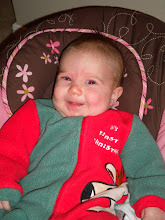 I have been meaning to blog for weeks now! But, we have a very wonderful reason why we have been so busy. Our precious baby girl is finally here! Linley Gregg Bristle came into this world and immediately blessed our lives on October 5th, at 12:32 pm. 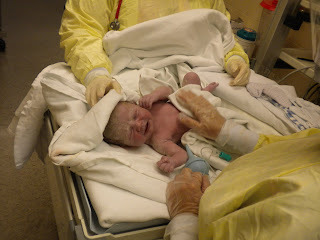 She weighed 7 pounds 10 ounces (our biggest baby!) and was 19 1/2 inches long. And.....she has a head full of beautiful brown hair. I just love it that she has brown hair. Her hair is just like her older brother Landon's. She even looks like Landon. But most importantly, she is healthy, alive, and with us. She gets her middle name from Landon. His middle name is Gregory which is my dad's first name. We are so thankful that she is finally here with us and that we can hold her. She is definitely an answer to our prayers. 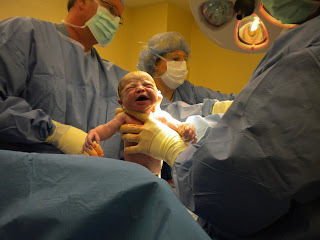 The day of my C-section seemed to last forever. 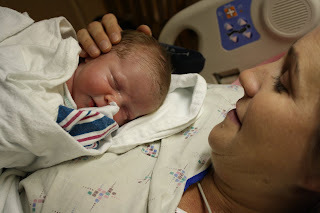 We arrived at the hospital at 10:00 and the c-section was scheduled for 12:00. For the most part, everything was running very smoothly. Ryan and I were both very anxious....we just wanted to get through this and to have her in our arms. Got all the prep work done and they were wheeling me down to the OR. 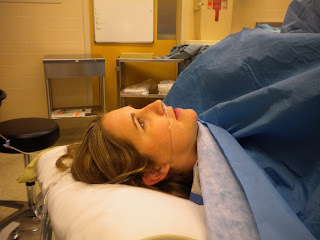 I had a flashback at the twin's c-section and I saw the OR that we were in last time approaching us on the left side. I thought to myself, "Please, don't turn left." And, they turned left. We were in the same room as last time. I started getting very anxious at this point and the nurses were so wonderful and understanding because our doctor made sure they all knew what had happened last time. I remembered looking up to the ceiling and just saying over and over again, "God just please let everything be okay." I haven't prayed so hard in my life. Then, my doctor came in and talked with us and reassured us that everything was going to be ok. I, of course, was crying. It was just so emotional and all the memories came flooding back. The anesthesiologist came and did his thing and I was numb quickly. He was very supportive too and did his best to keep us at ease. It seemed like 4 minutes later, they were pulling her out of me and the first thing our doctor said was, "Well, she does not have red hair!" "She has a head full of brown hair!" I lost it again. 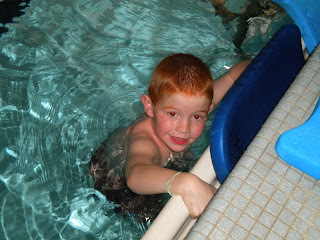 Landon had brown hair. Then, I finally got to see her. She was beautiful and even looked like Landon. Ryan thought so too. They took her back to get her measurements and this is when it really hit Ryan. They put her on the scale to weigh her, and she looked just like Landon did when they placed him on the scale. Ryan's face turned pale and he almost passed out. The nurses helped him sit down and they got him some juice. He felt better soon after that. It was just such an emotional time. Then, they took her and got her all cleaned up and did all the appropriate tests. 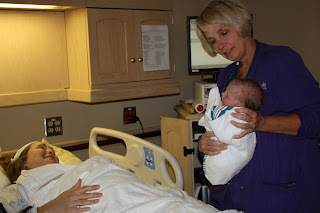 Then, a nurse from the nursery brought her to our room probably about 30 minutes later and I finally got to hold her! It was so good to see her and to hold her. I did a lot of crying, but they were happy tears. The pregnancy just seeemed to last forever and it was so nice to finally have her safe in my arms. We are so very thankful to God for blessing us with this baby girl. She is healthy, perfect and beautiful. I already can't imagine my life without her in it. 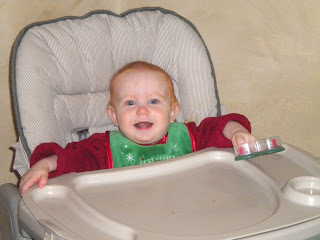 I am also thankful that she reminds us of Landon. They have the same hair color and the same nose and ears. God, thank you for this precious gift. Thank you for blessing me with a healthy pregnancy and a healthy baby girl. We continue to trust you and to give it all over to you. 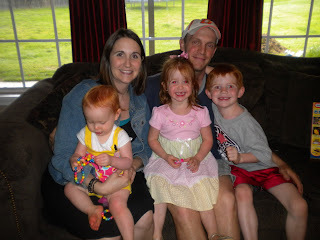 On April 29th, our precious Addison turned 4 years old! 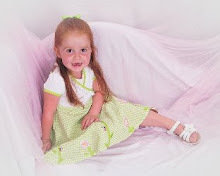 Oh my goodness....I just can't believe she is already 4! 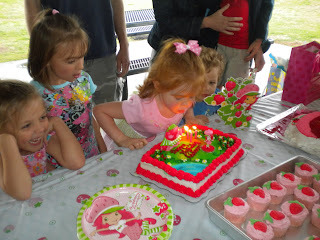 We celebrated her birthday with a Strawberry Shortcake party at one of her favorite parks in Jenks. 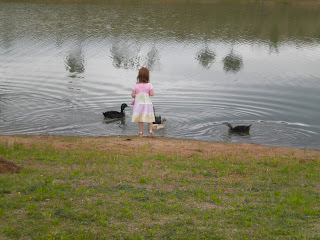 This park has an amazing playground, but you can also fish and feed the ducks, too...which is right up Addison's alley since she loves all animals! Here are a few pics of her day. Our attempt to a family picture before we headed out to the park! 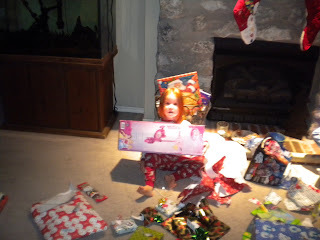 Addison opening up her presents. Love this sweet pic of Addison and Ragon! Addison made sure all of the ducks got plenty of food! Happy Birthday sweet Addison! We love you so much and you are just turning into such a sweet little girl. We love your passion for life and your adventurous spirit. You are such a blessing to our family. Just please don't grow up too fast! Well, our summer was a busy one, but full of so many good memories. 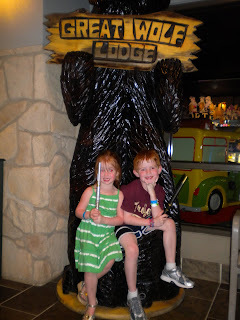 We started off our summer with a trip to the Great Wolf Lodge. 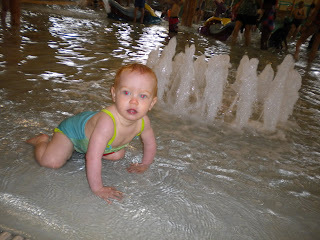 We have been to the one in Kansas City, but this time we made our way down to Grapevine Texas to check out theirs! After this trip, Logan and Addison started their swim lessons. So nice to have them both take at the same time! They just loved it! After this, Addison had her first dance recital!! I don't know who was more excited....her or her mommy! She took at the dance studio that I actually took from. 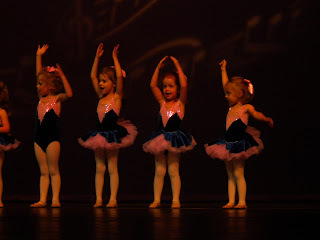 She had so much fun learning ballet and tap. Here are a few pics of her big day. I love this picture! 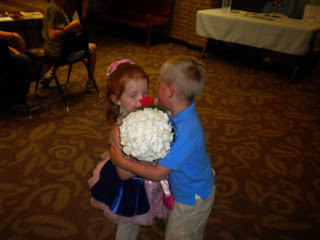 Katch brought Addison flowers for her first dance recital! 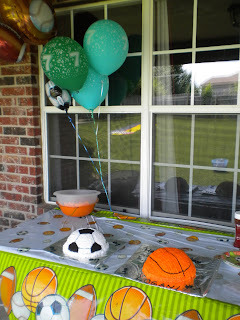 Ok, so next comes Logan's 7th birthday! 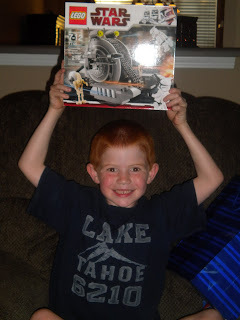 I can not believe that our little guy is already 7! This just blows my mind. Logan wanted a sports birthday party so we had all the cousins and Logan's buddies come over for a fun birthday filled with sports games and swimming in the back yard. Here are a few pics of his big day. 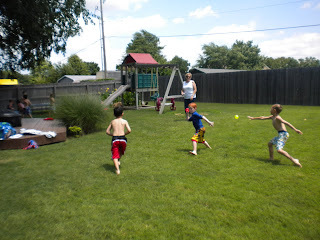 The water balloons were a hit! Happy 7th birthday Logan! You are such a blessing to our family. You have such a sweet spirit and it is so neat to see how you are already so protective of your little sisters! We love you so much! 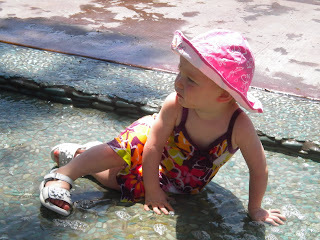 And....little miss Avery has definitely enjoyed her summer! 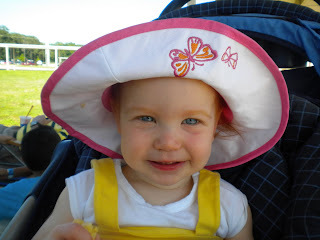 As I sit here and type this, Avery is 18 months old. Now that is hard to believe. 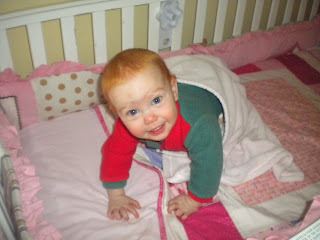 She is doing so many new things and is constantly trying to keep up with Logan and Addison. 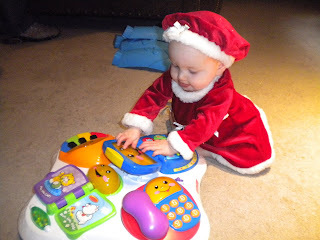 Some of the sweetest things that she is doing right now are the times when she tries to sing the ABC's or Twinkle Twinkle Little Star.....just melts my heart! Here are a few pics of her fun summer. 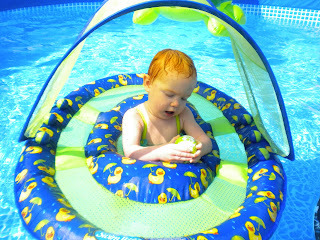 We spent many days in the pool! Avery, you are such an angel. You fill our hearts with so much joy. You are just so sweet and so loving and affectionate. You give the best hugs and kisses and I love it that you love to be cuddled so much. We love you! Something else that has really flown by is my pregnancy. I'm 33 weeks along and it just seems like yesterday that I found out that I was pregnant. I am going to the doctor every week now which is so nice. It is so reassuring to go in every week and to see and hear the heartbeat. Very early on in my pregnancy, my doctor gave me a doppler from his office to take home. What a blessing this has been. We get to hear the heartbeat at any time. This really helps me get from one doctor's appointment to the next. I have had a few bumps along the road with this pregnancy. I started having gallbladder pain in my second trimester. At this time, she was breech and I was carrying her very high and this was putting pressure on the gall bladder. She has now turned and has dropped somewhat and the pain has subsided. My doctor did order an ultrasound to the gall bladder and some blood work and everything checked out okay. Then, about 3 weeks ago, I went in and my doctor reported that my amniotic fluid levels were pretty high. He mentioned gestational diabetes as a possible cause and ordered the 3 hour fasting glucose test. Boy was that ever fun. :/ But, I passed! No diabetes.....thank God! I just saw him again today and he said that everything looks great including the amniotic fluid levels. God has been so good and I am continuing to try to place my trust in Him. Some days this comes fairly easy.....others it just doesn't. We are getting close to the 35th week in this pregnancy. This is when we lost Landon. I am scared. I am anxious. 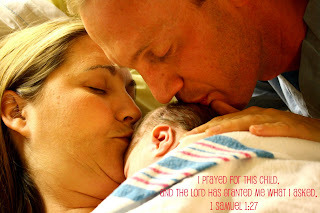 When I was pregnant with the twins I prayed constantly that everything would be okay. That the babies would be okay and that there would be no complications. That was not our outcome. I still don't know why. We may never know why. Some days I struggle so much with this and other days not so much. There is no rhyme or reason to grieving....that I have learned. You just need to let yourself feel all the emotions that you need to feel and along the way learning to trust the Lord with all your heart and cling to Him with all you have. I'm trying to understand that He knows the "why" and that should be good enough. He is omniscient, almighty, powerful and sovereign. He understands it all. He sees the big picture. He sees it from the beginning to the end. We are not omniscient. We don't see the big picture. We were not created that way. If we were, then why would we have to trust in God? We would know everything. And that would keep us from developing a relationship with Him. So, I may never know the "why" this side of heaven. Or, maybe I will years from now. Maybe I will have the chance to help someone else who has gone through something very similar. I pray this is the case. We are so thankful for this pregnancy. I knew it would be very hard emotionally to get pregnant again. But, once again, you really just don't know what you are going to feel until you are right in the middle of it. I have missed Landon so much during most of this pregnancy. I have had so many dreams of him during this pregnancy. 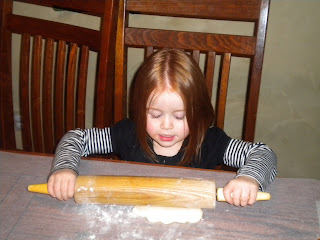 I see Avery and what she is doing and learning and I think to myself, "This is what Landon would be doing." I often visualize him playing right beside her and I imagine all the time about what they would be doing together. How they would play, interact, laugh, etc. Then, I think about him being in heaven with our Lord and Saviour and getting to see and experience amazing things. Then, my mind goes back to this pregnancy and the hope that I have in that. I am so thankful for the precious life that is growing inside of me. I pray that everything will be okay and that we will get to hold her. I know we don't know the outcome of this pregnancy, and that is so scary, but all I can do is trust Him. It's in His hands. Wow. I can't believe how long it has been since my last post! We have been soooooo busy lately and it seems like so much has happened. Hopefully I will be able to catch up! The months of January and February were extremely hard. It seemed like we had a long, hard, cold winter. Let's just say that I am so glad that Spring is here. January and February were hard since we were approaching Avery and Landon's first birthday. This wasn't the typical first birthday. 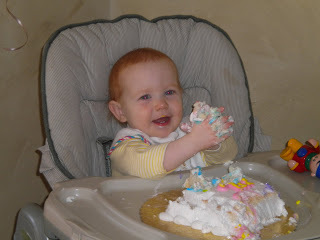 We were excited that Avery was turning one.....could not believe that a year had already gone by! But also, terribly missing our son Landon. 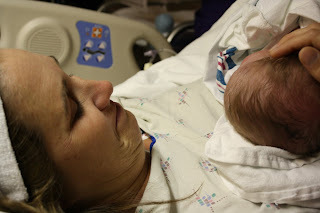 I just couldn't believe that it had already been a year since I held my son. I have heard that the weeks leading up to a "first" milestone are sometimes harder than the actual day of the milestone. The weeks leading up to the first birthday were very hard. I just didn't know what to expect. Uncertainty is so very hard. I continued to pray over and over that, "God, just take over....I can't do it." And He did. My husband and I had come up with some great ideas for their birthday. 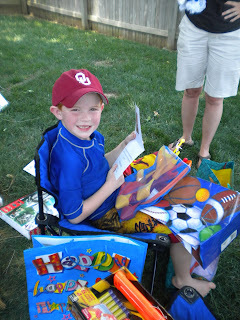 We wanted a special day for Avery, but also a special time to remember Landon. I had come up with a butterfly theme. A lot of you know my thing with butterflies. The fact that I tend to see butterflies everywhere....and I tend to see them when I am very down. 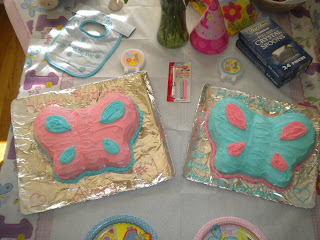 I ordered a butterfly cake pan and I made 2 butterfly cakes. I iced Avery's cake with pink icing and blue accents on the wings and I iced Landon's cake with blue icing and pink accents on the wings. It symbolized that Avery and Landon are still connected.....even from heaven. The day of the first birthday ended up being such a special day. All of our family was there to be with us. Avery really enjoyed eating her birthday cake and opening up her presents! 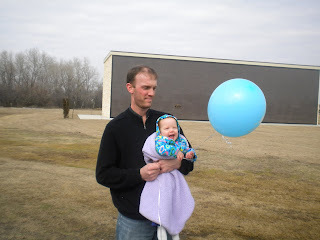 Ryan and I also decided that we wanted to do a balloon release outside with our family on the day of their first birthday. 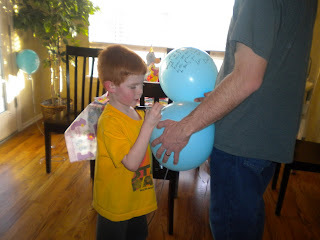 We had blue and pink balloons and everyone got to write a message on their balloon. Our 6 year-old son, Logan, wrote the sweetest message to Landon about how he missed him and couldn't wait to see him in heaven. Our 3 year-old daughter, Addison, drew a picture on her balloon for Landon. 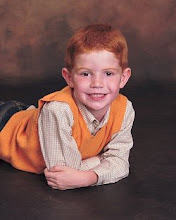 At this time, Ryan and I had the chance to share how Landon's life has affected our life. We also had a special time of prayer before we released the balloons. As we were releasing the balloons, our kids and my brother's kids were all saying how the balloons were going up into heaven to Landon so he could have them for his birthday. 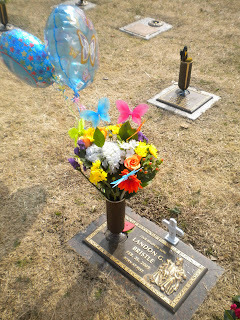 We also went to Floral Haven to place some flowers and balloons on Landon's marker. My sister met us out there and she had the prettiest butterfly decorations to place in the vase with the flowers. I also found some butterfly balloons to tie onto the vase. Our kids were such a big help in decorating Landon's marker. I am so proud of them. 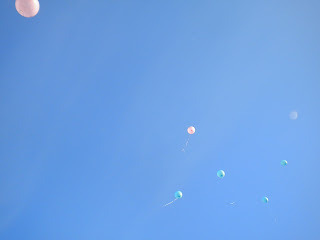 When we were there, we also did another balloon release. I am just in awe of all of the support we received around their first birthday. My best friend came the day of the birthday and brought a gift for both Avery and Landon. She also gave me the February birthstone charm to add to the bracelet she gave me on Christmas. She had also given me the butterfly charm on Christmas because she knew how much butterflies meant to me. Another dear, close friend brought by the most amazing book ever. She had some of our closest, dearest friends write letters to us about how their lives were touched by Landon. 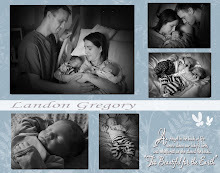 She also had pictures of Landon and Avery together when they were born. This was such an amazing gift. Reading the letters brought many tears, but also so much peace at the same time. It will always be such a treasure. 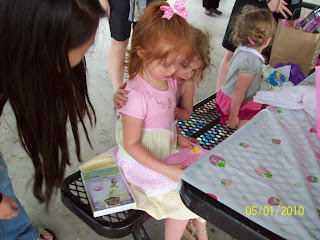 This close friend also brought the cutest black and white butterfly outfit for Avery. I had Avery's one year pictures taken in this outfit. Hopefully, I can figure out how to post those pictures on my blog. :) They turned out so good! There are also so many more ways people reached out to us. Another very dear friend of mine sent us a letter in the mail that we got on their birthday. She shared with us her heart and specific journal entries around the time that we lost Landon. Reading this letter also brought us a huge amount of peace. Another dear friend shared with me an amazing dream she had and how God specifically told her to pray. This was another way how God revealed Himself to us. We are just so amazed at the outpouring of love and support from our friends and family. 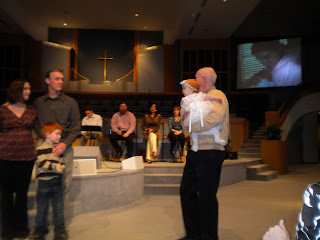 Another milestone that we conquered just the day after their first birthday was Avery's baby dedication. Once again, God took care of every detail. We met with our pastor a few weeks before the dedication so talk about what we would like to do and to get his feedback. It turned out being such a special, sweet time. 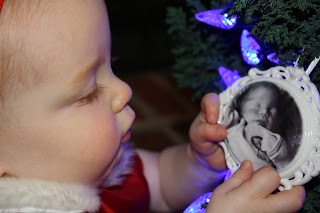 We were able to have pictures of Avery and Landon together and also pictures of Avery during her first year. One of the reasons we have been so busy is that we moved! God completely had His hand upon us moving. We were blessed to have an amazing group of people from our church help us with selling our home and finding and buying our new home. Shortly after their first birthday, Ryan and I were talking about how we needed more room. And, we have a very good reason why we need more room!! Ok, I do have some very exciting news to share! A lot of you already know this, but we are expecting!!! We are so excited! I am about 16 1/2 weeks along. Yes, I count that half! Especially when you are nauseated and throwing up everyday! The sickness has gotten a lot better and I am so thankful for that. We did wait a while to tell most people. So, around week 13-14 we shared our news! Our friends continue to show us so much love and support. Two of my close and dear friends loaded me up with the cutest maternity clothes. One of these amazing girls also gave me Angie Smith's new book, "I Will Carry You." It is such a good book. I'm almost through and I already want to read it again. God continues to reveal Himself to us....in big and in small ways. I am just so amazed by his love. Our due date just happens to be Oct. 15th. This day holds great relevance to us. 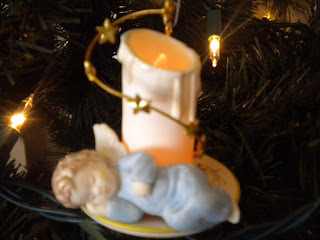 It just happens to be the National Day of remembering infant loss. Wow. God is amazing. To me this means that even though we are having another baby, Landon will always be with us. He will always be in our hearts and we "Will carry him" until we get to see him again. God knew that I needed this and He once again took care of every detail. So, continuing on with our Christmas. First of all, Ryan and I were so amazed to see how much snow was falling on Christmas Eve. I know this may sound a bit silly, but for me the snowfall brought a huge amount of peace. Just to know that we were going to have a white Christmas when we woke up Christmas morning. Wow. God certainly takes care of every detail. I can't remember the last time we had a white Christmas....and one being sooooo white! God, thank you! Your love is amazing!!!! One thing that has helped us is to do different things....making new traditions. The white Christmas for us was something different. It was something that we were not use to seeing year after year. Hope that all makes sense! We had a great time playing outside in the snow. We built a huge snow fort and had snowball fights and we built a snowman. During all of this, I was thinking, "God, I wish so much that Landon was here with us." But, you know, Landon is not missing out on anything. What he is getting to experience is beyond what we can imagine, right now. He is in perfect paradise with our Lord and Saviour. As the Lord was speaking this to me, I had another thought. 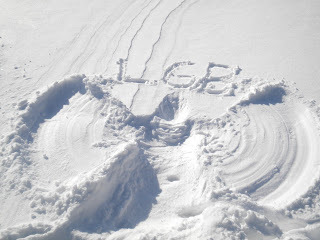 I immediately got down onto my back and looking up into the heavens, I spread my arms and legs out and in and made a snow angel for Landon. It was a way for me to feel close to my son. It was also nice being "snowed in." It took the pressure off of having to be anywhere at any certain time. We just got to hang out as a family and spend time together. 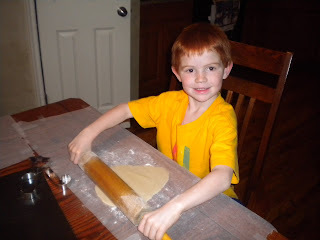 We stayed in most of Christmas Eve and had so much fun making cookies for Santa. 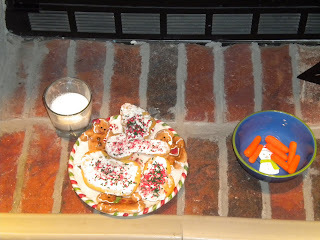 After our cookies were all made, we placed them by the fireplace along with some carrots for the reindeer. Can't forget those reindeer. 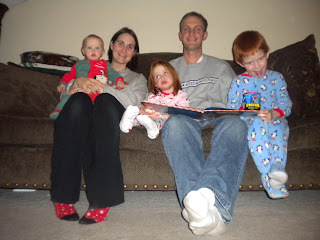 :) We all sat together on the couch and daddy read "The Night Before Christmas." 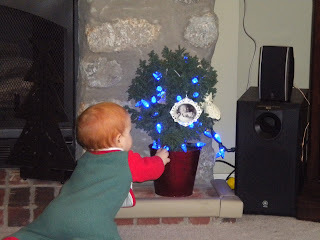 I had mentioned before, in another post, that we had gotten Landon a small, live tree and placed a strand of blue lights on it along with his ornaments. 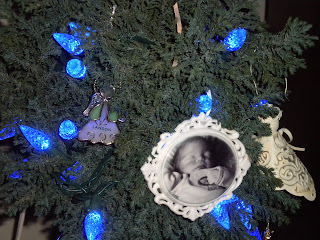 Here are some more pictures of Landon's Christmas tree along with some close-up pictures of his ornaments. 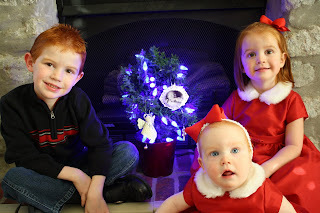 We used some of the pictures that our wonderful Miss Sarah took for our Christmas card. It was so wonderful to wake up to a very white Christmas. Logan and Addison ran into the living room to see what Santa had brought them. 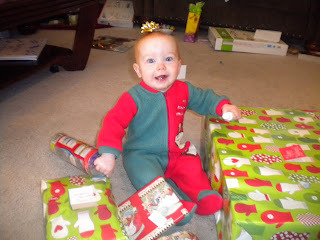 Avery woke up to her first Christmas looking so cute!! 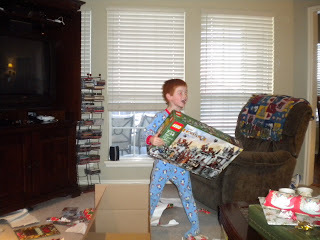 Later that day, we drove out to my mom and stepdad's house to celebrate Christmas with them. 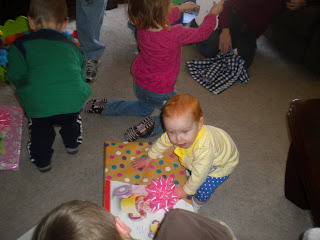 Logan, Addison and Avery had a fun time getting to open gifts with their cousins. The next day we were off to celebrate Christmas with my dad and stepmom at my aunt and uncle's house. 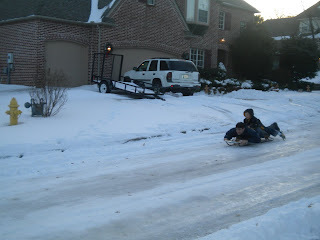 The kids had a blast getting to sled down a hill close to their house! 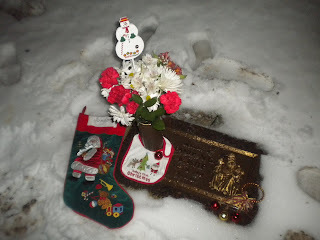 After we left my aunt and uncle's house, we drove out to Floral Haven to place some Christmas flowers and other items on Landon's marker. Still to this day, it seems so surreal every time we go out there. Then, when we are there, a peace always seems to wash over me completely. 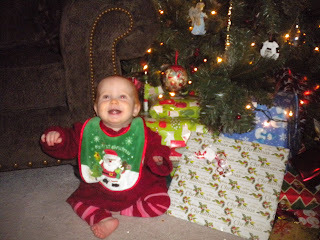 We placed some flowers in his vase and wrapped a "Baby's First Christmas" bib around the bottom of the vase. Logan brought a sleigh bell that he received in school when they had their Polar Express Day. Addison colored a page out of her coloring book and placed it in Landon's stocking that we layed down next to his marker. We all knelt down around his marker and prayed. As we prayed I heard the Lord speak, "Be still, and know that I am God." This blog has been created for a study on pslams for our 10th and 11th grade girls. Please read the psalm and post your thoughts. How do you relate to this psalm? How does it speak to you? 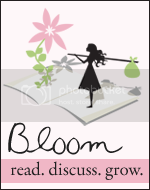 This blog is confidential and will only be viewed by the girls in our group.